Register today for the 7th annual UofL Pathways Women’s Leadership Conference, sponsored by Commonwealth Credit Union. Friday, May 17, 8:30 a.m. to 2:30 p.m. This year’s agenda includes remarks by University President Bendapudi and Provost Beth Boehm; Imposter Syndrome workshop by national author Valerie Young; and Finding your WHY sessions by UofL’s own Virginia Denny and Gale Rhodes. Join us for a confidence-building day. Announcing the Fall 2018 COSW Newsletter! The Fall 2018 COSW Newsletter has arrived! 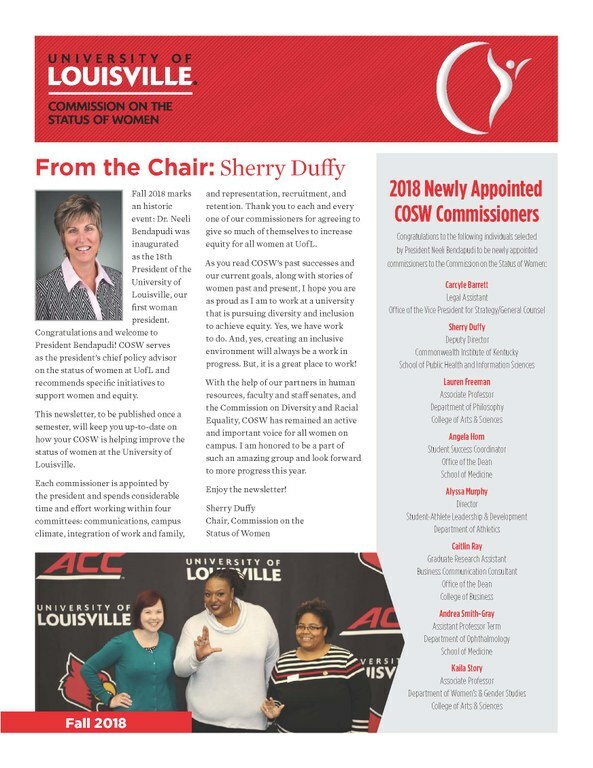 Read an interview with the COSW Champion Award Recipient, Dr. Gale Rhodes, learn more about Dr. Letitia S. Kimsey, the COSW "Women of UofL History" feature. Learn about new commissioners and our 2017-2018 sponsorship2. Enjoy! We are pleased to announce that Nancy Theriot, Ph.D., professor in Women's and Gender Studies, was awarded the 2018 Mary K. Bosteel Tachau Gender Equity Award at the 2018 Women's Empowerment Luncheon. The award is co-sponsored by the Commission on the Status of Women and the Women's Center. COSW Commissioners, along with Chair Sherry Duffy, were present to give the award. Nominations are invited for the Mary K. Bonsteel Tachau Gender Equity Award, which will be presented to a member of the UofL community whose work has directly furthered gender equity. The award will be given by the UofL Women’s Center and the UofL Commission on the Status of Women, at the Women’s Center Empowerment Luncheon in November. Examples of projects consistent with the scope of the Women’s Center, the Commission, and the focus on women’s rights which characterized Dr. Tachau’s life include, but are not limited to work that promotes women’s equality and gender equity, work that increases women’s self-reliance and work that highlights women’s contributions to all cultures and societies. The nomination form is no longer available. See pictures from last year's event here.